Five years after their first blogged adventure (She Said She Said London) Jenny Keroack, now 23 years old, and her mom, travel writer Geri Bain, set off on a new journey. This trip centered on three great societies: the Ancient Greeks, the Ottomans, and the Venetians. Starting in Athens, they set sail on a Windstar Cruise to Venice, tracing the interwoven histories of these superpowers. After the cruise, they headed to the Dolomites for a few days of hiking. As with their last adventure, they recorded their impressions and favorite finds along the way. Jenny’s are in italics; Geri’s are in regular type. 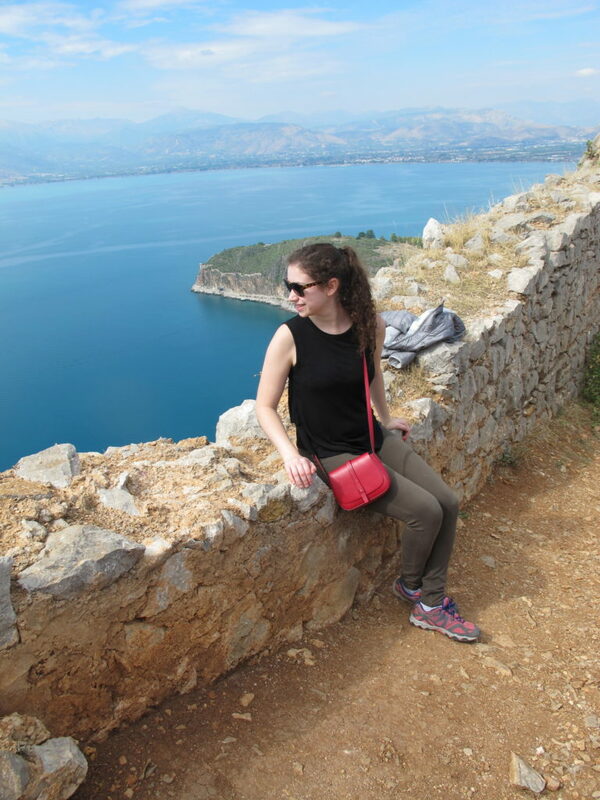 The following is their second installment, logged from Nafplio, Greece. We hated to leave Athens but were thrilled to wake up and find our ship (Windstar Cruises’ Star Breeze) docked in the center of Nafplio and know we’d have a full day (7 a.m. to 10 p.m.) here. 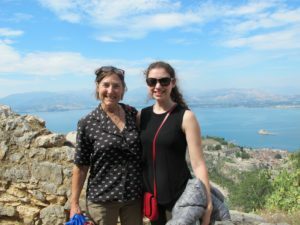 That meant that after a four-hour tour to ancient Epidaurus, we had plenty of time to enjoy Nafplio itself. The Theatre of Epidaurus. Who knew that theater was considered integral to good health in ancient Greece? That’s just one of the fascinating tidbits our guide Elsa shared on our tour of Epidaurus, an ancient sanctuary dedicated to Asclepius, the Greek god of healing. Most of the temples and other buildings are in ruins, but the Theatre of Epidaurus, renowned in ancient and modern times as among the largest and most beautiful of the ancient theaters, has survived amazingly intact. Each guide seems to have a different way of demonstrating the near-perfect acoustics, but the highlight of our visit was serendipitous. A group of German students stood in the center of the stage and sang, their lovely harmonies carrying clearly to the top seats where Jenny and I were. 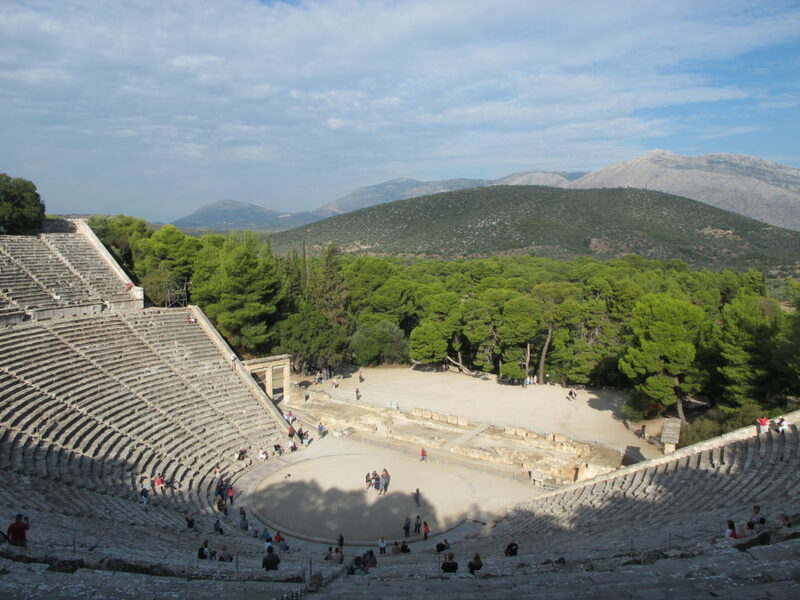 Now I want to return for the Epidaurus Festival, held here every summer. Palamidi Fortress is a maze of pathways with eight separate bastions. Palamidi Fortress. This fort passed from Venetian to Ottoman control when the original architect, who was never paid by the Venetians, got revenge by showing the Ottomans the way in. Their impressively petty move becomes even more striking when you’re inside the 708-ft high fort and realize just how hard it would have been to conquer. Even after you scaled the outer walls, the fort is a maze in which rooms that seem like they should connect never actually do. Literally every time we thought we had finally reached a point where we could go from one area to another, we found a great chasm or wall between the two spaces, meaning we would have to go a long way around to get to the next area. 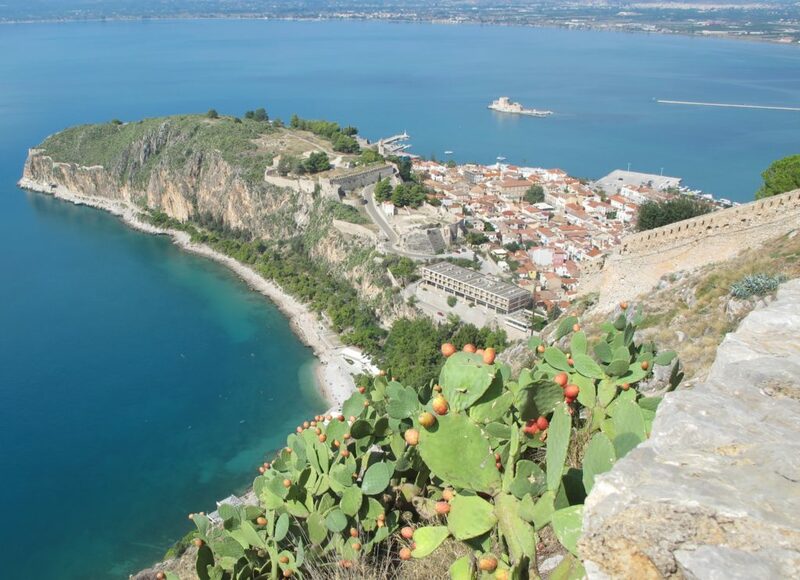 However, it’s worth the walk because the views of Nafplio, the Aegean Sea, and the surrounding hills are gorgeous. If you want to get to the fort you can walk up the stairs from Old Town (local rumor says there are 999 steps), or you can take a bus. Kastro Karima, a small eatery tucked away on a quiet back street, is worth seeking out. Old Town. Nafplio, the first capital of the modern Greek state, served as the seat of government from 1823 until 1834, when the capital was moved to Athens. You can see traces of this history around the old town, from the site of the first Greek parliament to the spot where the first modern Greek head of state Count Ioannis Kapodistrias was shot at Saint Spyridon church. The most dominant feature of the old town is the Venetian architecture, with its characteristic red roofs and colorful windows echoed in cities like Dubrovnik, Hvar, and, of course, Venice itself. The old town doesn’t take too long to walk around, 20 to 30 minutes should have been ample time to wander and shop, but we loved just being in this pretty town. 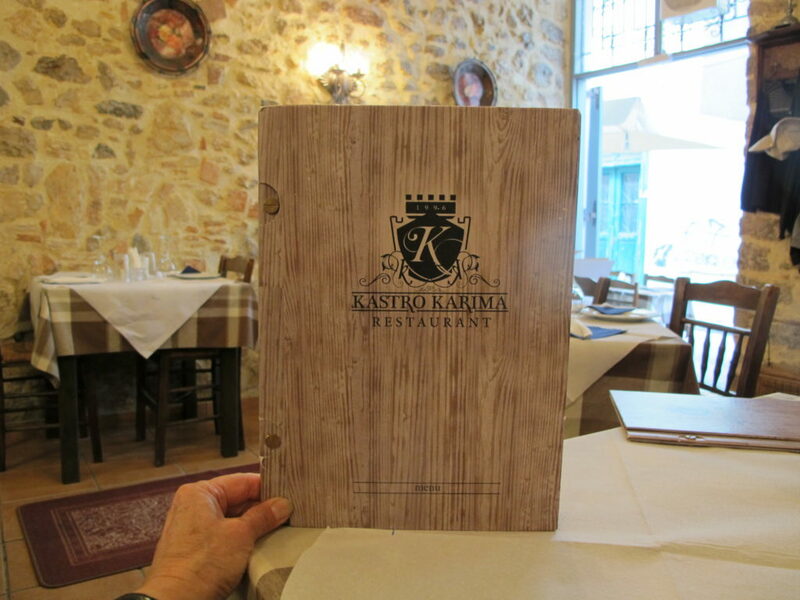 Our favorite spot—which we stopped into twice—was Kastro Karima. It has the best moussaka, and at reasonable prices. The Peloponnesian Folklore Foundation. We arrived at the museum after 2:15 p.m. and were surprised to learn that it closes at 3 p.m. We were upset at first, thinking we wouldn’t have enough time. As it turns out, the museum is charming, but quite small and 45 minutes felt just right to see this small but worthwhile collection. The museum is laid out on several floors of a neoclassical mansion. 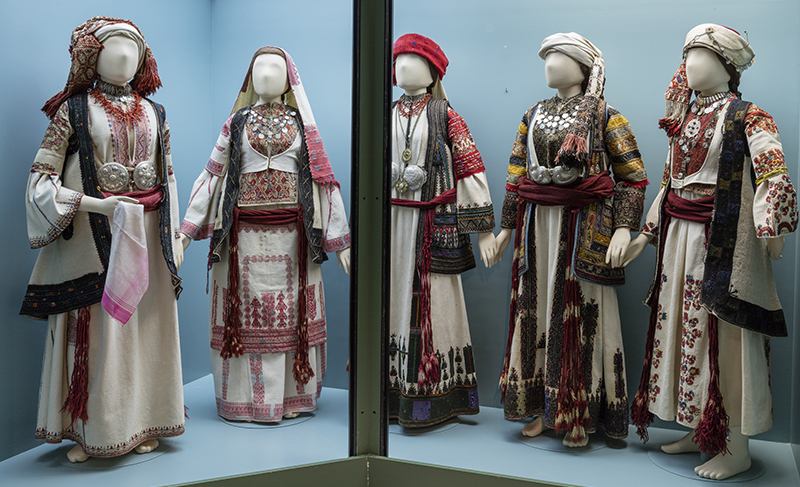 I especially loved the displays of traditional Peloponnesian costumes, dolls and furnishings, which included a dining room with the table set as though the family was about to walk in. Next: We are off to see Delphi and Olympia. Geri Bain (left), a widely published travel writer and editor, has written about more than 65 countries. While travel editor at Modern Bride magazine, she wrote an acclaimed guide to Honeymoons and Weddings Away. She is a past president of the New York Travel Writers Association and former editorial director of Endless Vacation magazine. 23-year-old Jenny Keroack, a recent graduate from University of Chicago, has written for The Gate, Observer Tribune and other publications and is now a Senior Analyst at National Journal’s Network Science Initiative.